As a writer, I have spent quite a bit of time doing researching topics and trying to find ways to make my books even better. I may be too much of a perfectionist, but I really want my entire book to flow smoothly and portray the emotions I truly desire in each scene. One of my areas where I feel I have always been weak is fight scenes. When I was approached to review a book on writing and describing fight scenes, I have to admit, I was pretty excited and couldn’t wait to get started reading Writing Fight Scenes by Rayne Hill. 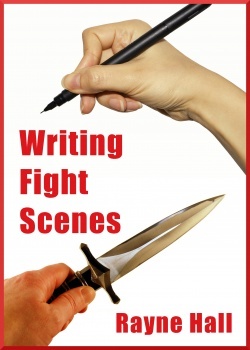 Writing Fight Scenes is an ebook that delves into the task of helping writers of various genres write engaging and realistic fight scenes. Each chapter of this book goes into different aspects of a fight scene, ranging from weaponry, scenery, and even the proper ways for various genders to fight. With very few books available to assist in writing fight scenes, this is an innovative, must read for any author! When I first started reading Writing Fight Scenes, I wasn’t really sure what to expect. Some books for writers are very helpful, while others are filled with tips that are a bit too general. With this book, Rayne Hill did a fantastic job breaking down fight scenes, weapons, fighting styles, and more. As well, there are wonderful videos and other examples to let you see the proper way to engage your audience and allow them to suspend disbelief. As a fantasy author, this is extremely important for me since I am dealing with magic and other mystical elements. My favorite chapters, however, are the ones dealing with weaponry since it goes into enough detail to even allow someone who has never used one of these weapons write a proper fight scene. Overall, I have to say I am pretty impressed with this book. I love the down to earth explainations, examples, and even the tips on what to avoid when writing a fight scene after each chapter. As a fantasy author, I have a feeling I will be revisiting this book quite a few times as I continue my novel. Based on my own experience reading Writing Fight Scenes, I am happy to give this book an A rating. If you would like a purchase a copy for yourself, make sure to check out Amazon.com! Game Of Thrones or maybe watching some Spartacus for visual reference. Instruction manuals are pretty boring, sadly. Might be helpful, but interviewing experts and reading first hand accounts help too. Police reports sometimes have great details of how real fights played out to give an idea.